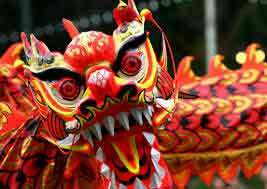 Chinese Lunar New Year in Indonesia is the first day of the year. This holiday occurs on the first day of the year on the Chinese calendar. This day is also known as the Spring festival. People will celebrate by attending parades and dragon dances in various communities. People hope to attract prosperity and good fortune in the New Year. Many will spend time with family and friends. Chinese New Year is not an official national holiday, so government and businesses will be open. A long time ago an emperor, named Shen, wanted his people to worship heaven and earth. That day was known as the first day of the first lunar month. In 1911 the Chinese started to use the Gregorian calendar and named Chinese New Years the Spring Festival.